The deployment of autonomous vehicles holds the potential to positively transform the transportation network. MAPC supports transportation that provides sustainable, accessible, and affordable service to the 101 cities and towns in the MAPC region. 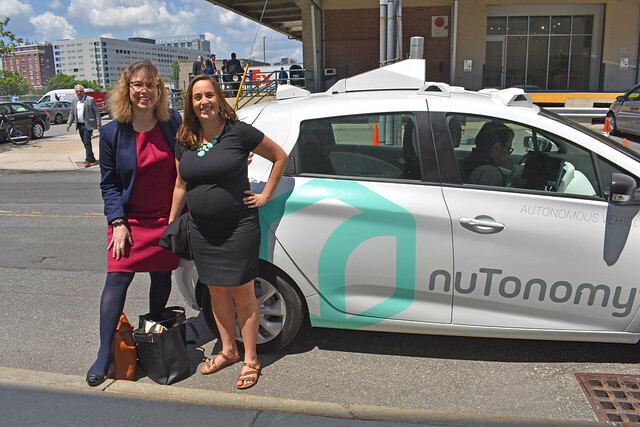 We recognize the transformative benefits that autonomous vehicles can have for Massachusetts’ economy, environment, and quality of life – as well as the challenges that could result from disruption to existing forms of mobility. Autonomous vehicles will affect not only our transportation system, but also our economy, safety, workforce, environment, land use, and energy use. The deployment of autonomous vehicles holds the potential to positively transform the transportation network. The positive transformational impacts include strengthening public transportation, reducing crashes and fatalities for drivers, pedestrians and bicyclists, as well as reducing traffic congestion and greenhouse gas emissions. Autonomous vehicles also have the capability to lessen the need for parking facilities and increase mobility for those who cannot drive. For more information, contact Senior Transportation Planner and Emerging Technologies Specialist, Alison Felix. In May 2017, the MAPC Executive Committee adopted a set of legislative and policy considerations. The intent of the legislative and policy considerations is to encourage the Commonwealth and our member municipalities to safely and equitably accommodate autonomous vehicles on the roadway network. Considerations outlined include data collection and data sharing, potential changes to municipal and state revenue, public infrastructure, safety, speed limits, autonomous delivery of goods, land-use, parking, and long-range planning. Companies looking to test autonomous vehicles on Massachusetts roads will now have a much easier time experimenting on a variety of road conditions, thanks to a MAPC-facilitated Memorandum of Understanding streamlining and standardizing the application process. On Thursday, June 21, representatives from 14 cities and towns, the Massachusetts Department of Transportation, and the Department of Conservation and Recreation gathered with Governor Charlie Baker and local technology companies to launch the agreement, which will allow testing of autonomous vehicles to expand in Massachusetts. Read the recap here. MAPC collaborated with the Town of Arlington and organized an evening educational forum on November 14, 2017 on the topic of autonomous vehicles. The event included industry experts and addressed the implications of AVs on policies, regulations, and infrastructure. What will they change - and when? On June 13, 2016, MAPC and Transportation for Massachusetts (T4Mass) hosted a forum exploring the transformative technology of autonomous vehicles and their likely impacts. The event gathered an audience of 250 at the Massachusetts Institute of Technology. The forum featured an expert panel from both the public and private sectors and covered topics including driverless car technology, timeframe for implementation, how driverless cars could change the role of transit in communities, and the role of government in the process.